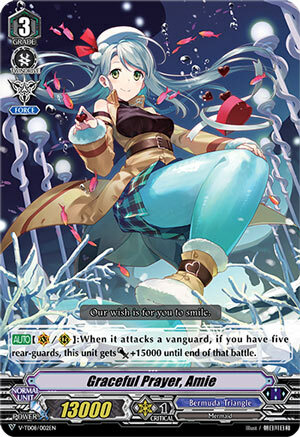 [AUTO](VC/RC):When it attacks a vanguard, if you have five rear-guards, this unit gets [Power]+15000 until end of that battle. I only picked her because I had to choose something for mermaid week. I can’t exactly talk about her without thinking of the much better G3s we get in the Extra Booster, so for now just use her as a placeholder G3. The dirty columns in Premium however (Meggido will like the power from this a lot). Also can I take a moment to just be annoyed at how much Great Composure Dragon from another Trial Deck needs to work for smaller numbers than this?